3. contra natural (“Argentum Vivum”) has the power to unbind metals etc.= Secret Fire. wine. 1st miracle. (see here the beginning of the Great Work for P. Stone). 2. Rain water is a neutral chaos; plants absorb it, it becomes their blood. (grapes are the best example)…. This particular image shows the Rebis standing upon a dragon breathing flame. 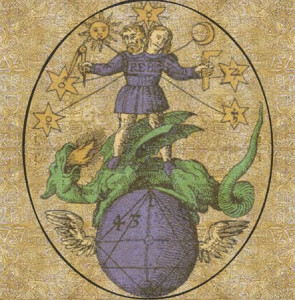 The dragon in this context is one of the Tria Prima; sulfur – the potential of the spirit – shown through transformative flame. Supporting the Rebis is the globe of the Earth. Within it are the square and triangle. Together, the circle, the square and the triangle are the greatest of all shapes to the alchemist. The square is the corps, the triangle the spirit, and the circle is the realm of the divine. The wings attached to the globe reiterate the transcendental quality of these figures. Within the square (which is the material and the corporeal) is the number 43. This has a twofold meaning. Firstly, it is a degree of measurement (another concept important to the alchemist), and secondly its sum is seven, the most perfect number, ascribed to the divine. One can also observe that the four rests within the square, while the three is similarly placed within the triangle. As to further place significance on measurement, the female holds in her hand a square, and the man holds a compass. Today, the square and compass are most visibly identified with the esoteric order of The Freemasons, who use it for the teaching of metaphysical concepts, as well as using it as a constant reminder of the necessity to keep good judgment and morality. Surrounding the Rebis in a semi-circle are seven figures for the seven classical planets. 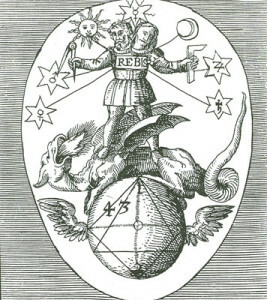 Five of these seven are inscribed with their planetary influence, while the parent metals of the seven (Sol and Luna) are shown as the sun and the moon. Once again, this concept of seven being a figure of transformation and divinity reemerges.